Clarksville, TN – As one of four teams tied atop the league at 8-2, Austin Peay State University (APSU) men’s basketball looks to take care of business when it returns home for a Thursday night, February 7th, 8:00pm tip-off against SIU Edwardsville in the Dunn Center. The Govs look to do their part to remain at the top of the league; none of the principles involved in the four-way tie between Austin Peay, Murray State, Belmont or Jacksonville State will square off this weekend, meaning all four will look to avoid upsets heading and secure their standing in the top-four. After a 30-point showing Saturday at Jacksonville State, sophomore Terry Taylor enters play as the Ohio Valley Conference Men’s Basketball Player of the Week, his third time this season earning the league’s top individual weekly honor. Among the 351 schools participating in Division I hoops, SIU Edwardsville is among the bottom-15 in scoring defense (81.1 ppg, 340th), field goal percentage allowed (49.3 percent, 348th) and three-point field goal percentage (29.0 percent, 340th). That’s the bad news for the Cougars. SIU Edwardsville does some things very well, boasting a plus-1.6 turnover margin and getting to the line, making 342 free throws in 500 attempts, all among the top marks in the league. But the Govs (at plus-3.83 turnover margin and 359-of-513 at the stripe) do those things just a little better. The Cougars feature four players averaging in double figures, led by Tyresse Williford, the current OVC Newcomer of the Week. The Govs would do well to finish this one off in regulation; SIU Edwardsville leads the country with five overtime contests played this season and eight total overtime periods, including a double-OT win last Saturday at Eastern Kentucky and a three-overtime thriller at Southeast Missouri, Jan. 24. Taylor dropped a career-high 33 points on the Cougars, helping Austin Peay hold off a feisty SIU Edwardsville squad in a 79-71 victory at the Vadalabene Center, Jan. 17. Try as they might, the Govs could never quite convince the Cougars to go away, leading by three at the break and just five with under eight to play before an 11-3 run put the Cougars awawy for good. Austin Peay’s defense held the Cougars at bay most of the evening, allowing just 37.9 percent shooting and securing a dozen steals. Taylor needs just 43 points to become the 36th member of Austin Peay’s 1,000-point club, and one of just six to do so in his first two seasons. A win would be the Govs ninth consecutive win against the Cougars, their longest active streak against a league foe and longest against any OVC opponent since an 11-game streak against Jacksonville State (January 4th, 2007-Jan. 14, 2012). At the charity stripe, the Govs are now 75.0 percent (66-of-88) over the last four games. Senior Zach Glotta needs 15 three-pointers to pass Donald Tivis (1988-91) for eighth all-time. A win would make the Govs 7-1 at home, their best eight-game home start since 2007-08 (7-1). 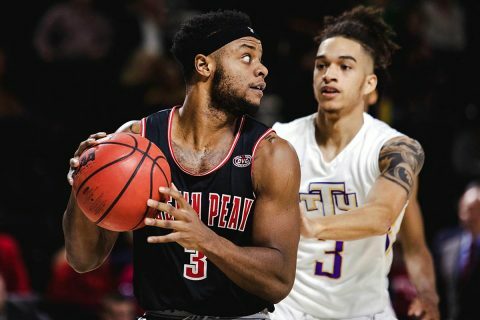 When Jacksonville State missed all 15 of its three-point attempts against the Govs, it marked the first time since March 6, 2009 Austin Peay had held its opponent without a make from deep, a span of 313 games. A victory would be Austin Peay’s best 10-game start to OVC play since 2007-08 (10-1). Jabari McGhee is shooting 61.5 percent from the floor over his last four games. Over the last 15 games, the Govs are shooting 50.6 percent (460-of-910) from the floor; they’ve won 12 of those contests. Just four times during that stretch have the Govs been below 50 percent, with a low of 40.7 percent at Arkansas. The Govs’ 20-game streak of shooting at least 40 percent from the floor is Austin Peay’s longest since a 20-game streak to start the 2000-01 season.